*Information courtesy of the Jamaica Bauxite Institute. The Image and shows Alumina production for January 2010 – December 2018. Alumina is extracted from bauxite through a complex process which involves caustic soda and quite a bit of energy. 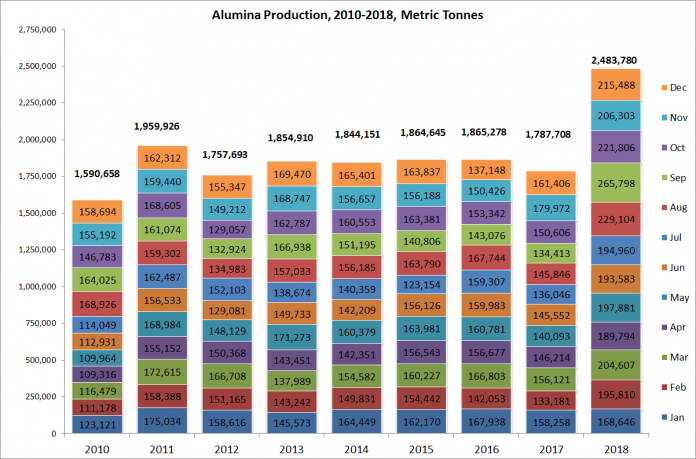 Alumina is one of the country’s traditional and most important exports. The jobs the industry provides are usually higher paying than average and provide a high economic multiplier for the nation.